Here's a personalized favor that your guests won't want to be without. And this one will keep the memories of your special day brewing for years to come. From Fashioncraft's Silkscreened Glassware Collection, each favor measures 3.75" tall x 4.5" in diameter, with an 11 ounce capacity, in a classic mug shape with a sturdy handle for an easy grip. 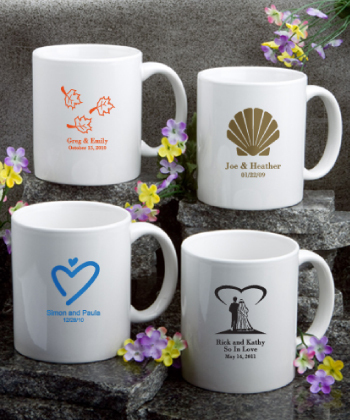 Each is made of black ceramic and they're perfectly fitted to be silk screened with amazing accuracy directly on the ceramic in a wide variety of all occasion themes, designs, colors and titles that match your theme and your personal preferences. 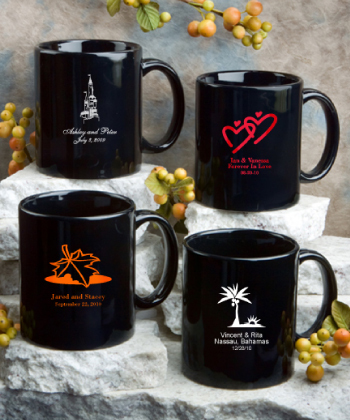 Sure to be a memorable addition to your guests' morning routine or coffee break, these personalized black ceramic coffee mug favors come bulk packed. Please allow two weeks for silk screening and processing as well as transit time for shipping to your location.